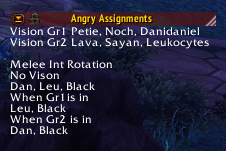 A new addon Regulators require for raiding is Angry Assignments but why? It is a great tool to help people remember stuff during fights. You can place it on the side of your screen and reference it during the fight. As you can see from this picture it is an assignment from Hellfire High Council. Once the Raid Leader or Raid Assist makes a page and tells the addon to display it will show up on your screen with the direction we need to go. Another example the Kilrogg Deadeye fight. Groups and Interrupts. It is a very lightweight addon but can be very powerful. You can find the link to curse HERE.